Easy banana berry oat muffins, sweetened with honey, are a great breakfast or snack. Little ones love these and so do big people too! When my son turned one, I celebrated. 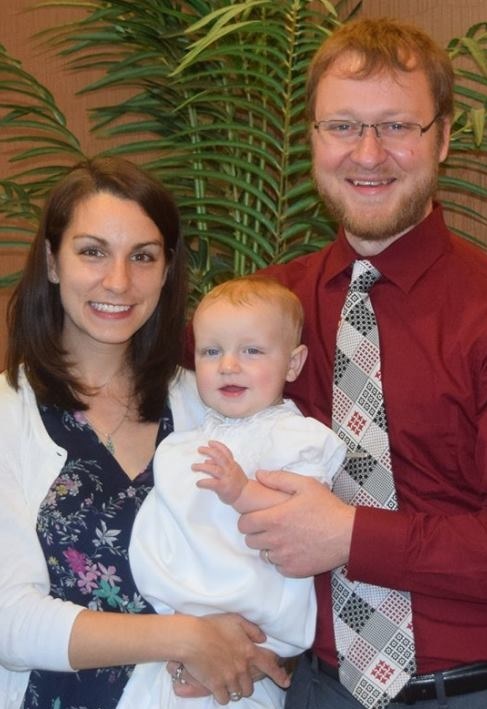 Obviously partially because we survived the first year… but also because fiiiinally he could have honey! I love honey! Whether I’m adding a bit to my bowl of oatmeal in the morning, or baking with it… I love it! It feels healthier than regular ‘ole white sugar, and it has a distinct and delicious taste. Even though honey isn’t technically “healthier,” it does have some advantages over sugar, especially in terms of a sweeter taste (so you can use less), antioxidants, and the like… If you can find local, raw honey, it’s even better! If you’ve been reading my blog for any length of time, you may know that I LOVE muffins. I haven’t baked muffins as often in the past year because I haven’t had as much free time (babies take time, did ya know? ), but lately I’ve been getting back into my baking ways. My son is only sixteen months old but he eats SO. MUCH. FOOD. He’s always hanging on my leg begging for “mum” (yum), and it’s fun to make homemade treats for him to enjoy. Recently when I made a batch of these muffins, I took the time to take photos BEFORE I froze them all so I could share the recipe with you! Whether you want to make these muffins for your kiddos or just for you, I’m sure you’ll enjoy them. They really are very lightly sweetened but I love that… you can taste everything in these muffins, not just a bunch of sugar. Bananas, berries, nutty oats, and honey… it’s all there, it’s all good (and good FOR you)! Hope you enjoy! Preheat oven to 375 degrees F. Line a 12 cup muffin tin with paper or silicone liners, or grease well. In a large bowl, whisk together coconut oil, honey, yogurt, and vanilla until well combined. Fold in mashed banana. In a separate bowl, stir together flour, oats, baking powder, baking soda, cinnamon, and nutmeg. Slowly add dry ingredients to the wet ingredients, and gently mix together. Do not overmix! Fold in blueberries. Divide batter between muffin wells, then bake for 18-25 minutes or until just golden brown on the top. Mine are usually done in about 19-20 minutes. After cooling for a few minutes in the tin, invert on a cooling rack to cool completely. Original recipe can be prepared using a stand mixer as well. I make these muffins using silicone liners and they usually make about 24, instead of the 12 this recipe says it yields. I think they’re a bit smaller though. Store in an airtight container or ziptop bag on the counter for up to 3 days. These muffins freeze beautifully too. Lightly sweetened banana muffins… these muffins are a simple, wholesome treat you will want to make again and again! If you love the taste of honey in baked goods, these muffins are for you! Happy Secret Recipe Club Monday! I’m comin’ atcha from April, because who knows when this baby is going to come! Or if he has already, or if he is coming now, or what. 🙂 But I wanted to make sure I got my recipe in this month so here ya go, friends! This month for SRC, I was assigned to Rafeeda’s lovely blog, The Big Sweet Tooth. Rafeeda has so many amazing Indian recipes on her blog that she makes for her family [a husband and two kiddos]! It almost seemed a shame to make something as basic as muffins, but it seems like Rafeeda likes banana treats quite a bit because I counted a good 8 or 9 banana muffins/breads/loaf cakes on her blog. I love banana-based muffins a lot so it sounded like a good idea, especially during a busy time in life. But I definitely have bookmarked some other recipes like Varutharacha Urulakizhangu Curry – Potato Curry in Roasted Coconut Masala,Koshari – Lentils and Rice with Tomato Sauce, Channa Masala – Chickpeas Curry in Coconut Milk, and Dark Chocolate Orange Cake with Orange Glaze to try later. Mmm! But in the meantime, I’m not complaining about making these honey banana muffins. They are SO good! They’re super light and simple, but so flavorful. As I was baking them, I realized there wasn’t any real fat in the recipe – no butter, oil, or eggs… just banana, baking soda, and baking powder for leavening and brown sugar, cinnamon, and honey for flavor [plus bananas! duh!]. I used white whole wheat flour as the base, but you could use all-purpose or even whole wheat flour if you prefer. The original recipe didn’t call for any mix-ins but I wanted to spice up a few, so I added some cinnamon chips to some and some mini chocolate chips to others. You can add anything you want, or nothing at all… they are great either way! You could also make these muffins as bread, but as you know, we prefer muffins over quick bread so I hope Rafeeda doesn’t mind the liberties I’ve taken with her recipe. 🙂 I think this is one I’ll be coming back to over the summer as the baking urge strikes when I’m busy with the baby! These muffins are healthy, easy, and delicious. What more do you need? Thanks, Rafeeda! Enjoy, everyone! any desired mix-ins: chocolate chips, cinnamon chips, coconut, granola, etc. Preheat oven to 325 degrees F. Line muffin tins with paper liners or grease well. In a medium bowl, stir together flour, brown sugar, baking powder, baking soda, and cinnamon. In a small bowl, whisk together honey and milk. Add mashed bananas and stir until combined. Pour wet ingredients into the dry ones, and fold together until just incorporated. Divide batter between muffin cups, then add mix-ins to individual muffins as desired. Bake for 20-22 minutes, until tops are golden brown and a toothpick inserted in the center comes out clean. Cool completely before storing in an air-tight container at room temperature for 3 days. After that, freeze for best results. Original recipe was for honey banana bread–use a large loaf pan and bake for about 45-50 minutes. Sweet and tender muffins… these glazed almond poppyseed muffins are a great addition to your muffin repertoire! After taking one bite of these sweet little treats, Ben exclaimed, “I sure made a great choice!” And he did. These muffins are incredible! I’m not gonna lie–these muffins are more on the cupcake side of the muffin spectrum, not healthy in the least… but they are tasty so we’ll let it slide! 🙂 The texture of these muffins is perfectly cakey and soft, very similar to my trusty Grandma’s Blueberry Muffins… even though this recipe uses oil instead of butter. Crazy! If you have an almond lover in your life, I think this base recipe–sans the poppyseeds–would be wonderful with some buttercream frosting! As it was, the poppyseeds gave these muffins a decidedly nutty taste with a wee bit of crunch… and that crunch was intensified with the orange juice-almond glaze that I brushed on top as the muffins were cooling. Oh man! Don’t skip that part–it’s pretty much the best. Interestingly enough, this glaze is made with granulated sugar, orange juice, and almond extract. I’ve made many glazes in my baking life, but never with granulated sugar. The result [that you can’t see in these photos] is a sparkly glaze with more than your average amount of glaze-y crunch. I was skeptical that a glaze made with granulated and not powdered sugar would actually work, but this recipe proved me wrong. Woohoo! New baking trick! 🙂 The orange juice in the glaze gave these muffins the hint of citrus they were begging for, without being overpowering. I think next time I make these muffins, I might stir some orange zest into the glaze and sprinkle some almond slivers on top! And yes, there definitely will be a next time! 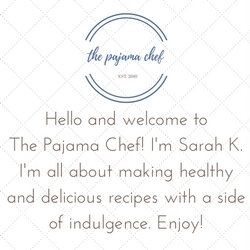 Enjoy–and be sure to thank Sara as I am doing for this wonderful recipe! Preheat oven to 350 degrees F. Line muffin cups with paper liners or grease with cooking spray. In a small bowl, stir together flour, sugar, and baking powder. In a large bowl, whisk together oil, eggs, and vanilla, almond, and butter extracts. Alternate adding flour and milk until just combined, then fold in poppyseeds. Divide between prepared muffin cups, and bake for 20-22 minutes, until golden brown and a toothpick inserted in the middle comes out clean. Cool in muffin pans for 10 minutes, then turn out onto wire rack. In a small bowl, whisk together sugar, orange juice, and vanilla, almond, and butter extracts. Spread over warm muffins and let cool to set. Original recipe yielded 2 9×5 inch loaves of bread. I reduced the recipe by half. I reduced the sugar for the half batch from 1 1/4 cups sugar to 3/4 cup; used 2 eggs instead of measuring out 1.5 eggs since the original recipe called for 3 eggs; and omitted the butter extract. To make this recipe as bread instead of muffins, bake for approximately 1 hour. Be sure to check out all the other delicious recipes featured this week from Secret Recipe Club bloggers in group C at the link below! 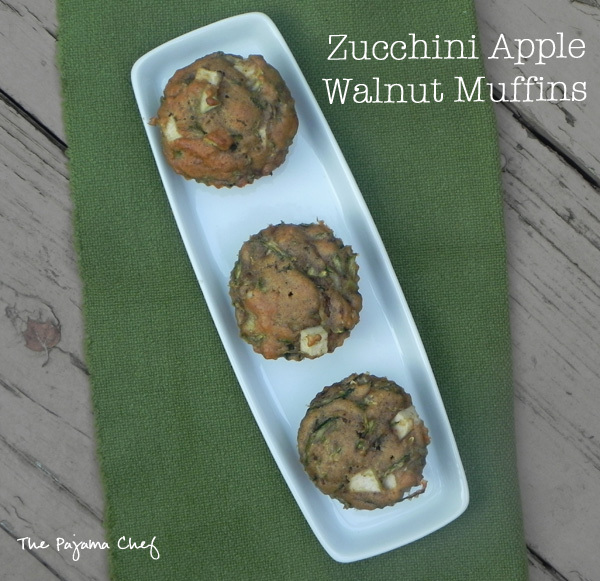 Take zucchini muffins up a notch with some sweet bits of apple and crunchy walnuts. You’ll always be coming back for just one more muffin, I promise. This month for Secret Recipe Club I was assigned Chelsy’s blog, Mangia. Mangia means “eat” in Italian and boy does Chelsy make some good things to eat! She lives in Texas where she is a personal trainer, prefers pjs/workout clothes to jeans [ME TOO! ], and loves sharing her food with family and friends. Fun fact: Chelsy started her blog in July 2010 just like me. We’re practically twins. 🙂 Since she’s been blogging for SOOOO long, there were so many great recipes to choose from. Eventually I settled on these muffins but first I was sidetracked by other deliciousness–Tahini Chickpea Salad, Ultimate Mushroom Soup, Lemon Sweet Potato Muffins, and Toasted Coconut Espresso Mini Muffins. NOM! I’m going to have to try allll those recipes, asap. But in the meantime, I’ll be over here munching on these Zucchini Apple Walnut Muffins. They are amazing, you guys! Where do I start? For one, like most muffins I make, they’re really fairly healthy and as such, a great snack or breakfast [though let’s be real: one muffin is not my idea of a filling breakfast, but I digress]. Agave is the only added sweetener in these muffins. I have mixed feelings about agave, so you could always use honey if you prefer. I just had a bottle that I’m trying to use up! They’re also made with white whole wheat flour, coconut oil, and walnuts for some crunch! I’m normally not a fan of nuts in baked goods, but they work here for sure! 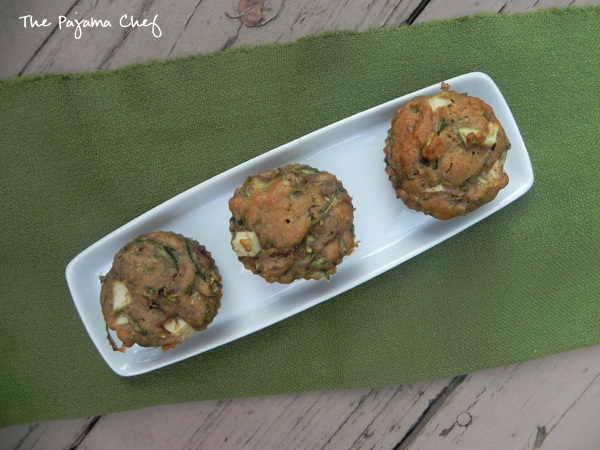 Zucchini and apple combine to make a super moist, super flavorful, super delicious muffin. Though they don’t really need anything else to make them yummy [besides the aforementioned walnuts], some pumpkin pie spice [because I can’t wait for pumpkin season and didn’t want to use just cinnamon] and coconut emulsion really spiced these babies up a notch! Speaking of babies, I made them over the weekend when my mom, sister, brother-in-law, and my cute nephew were here. Let me just say everyone inhaled these. So they’re family approved and ready for making in your kitchen! 🙂 Enjoy! P.S. I forgot to mention that Chelsy’s original recipe used coconut flour and as such, are gluten free. I just used ingredients I had but check out her original recipe if GF is your thing! Preheat oven to 350 degrees F. Line a muffin tin with paper liners or grease with cooking spray. In a large bowl, stir together flour, baking soda, baking powder, and pumpkin pie spice. In a medium bowl, whisk together zucchini, apple, eggs, agave, oil, and coconut emulsion. Gently add wet ingredients to dry ingredients, then stir until just combined. Fold in walnuts. Divide batter between muffin cups, filling 2/3 of the way full. Bake for 20-22 minutes or until golden brown and a toothpick inserted in the middle comes out clean. Enjoy immediately, or cool on a wire rack for later. Muffins freeze well! Check out the other SRC recipes below!